Prior to our “scratchy” convo the other mornin’, I was looking around for some options to make a healthier “peach-crisp-esqe” pancake with the few peaches we had left from our trip to the orchard for FREEZE-O-RAMA. 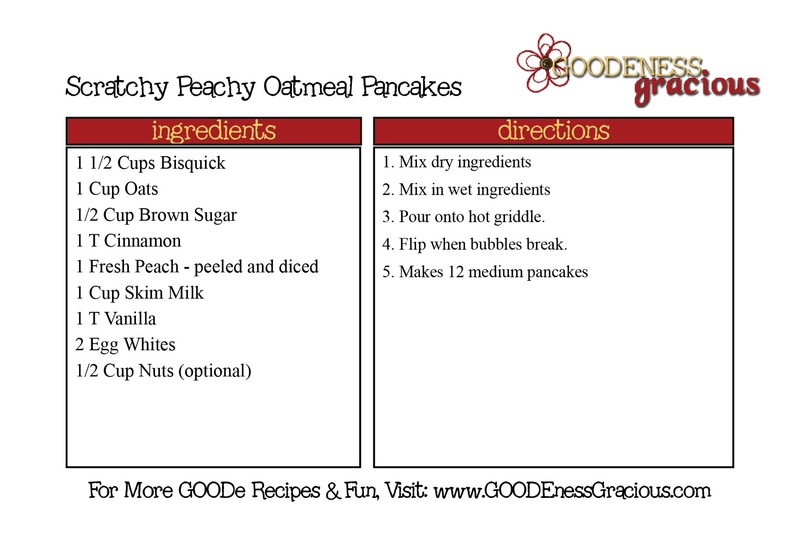 I found this blog while googling “peach oatmeal pancakes” and oh, my heavens does her food look good! Turns out she had just the kind of thing I was looking for, but I needed to alter it to fit what was in my cupboards and to lighten it up a bit. So I grabbed Miss Add and we got down to business. We started with 1 1/2 Cups of Heart Healthy Bisquick. We then added 1 Cup of Oats. Meanwhile, I placed a peach in some boiling water for about a minute to loosen the skin. Back to the bowl… Miss Add then added 1/2 Cup of Brown Sugar to the dry goods. I then diced up the peach and Miss Add tossed ‘er in. SIDE NOTE: Psst… notice my engagement ring? That is what I do to remember something… could be anything… but it works. It is like tying a string around your finger to remember something. So, if you ever see me around with my ring turned… remind me not to forget, k? She decided to make her “scratchy” cakes into “Ernie” shapes. Truth be told, these little guys were so flavorful and yummy that we didn’t even need syrup! We just grabbed some chocolate milk and gobbled them up! These definitely made the FREEZE-O-RAMA cut. Truth be told, we made up a quadruple batch to freeze (and use up the rest of our peaches;)). We also took some to Papaw since he is an uber peach fan.